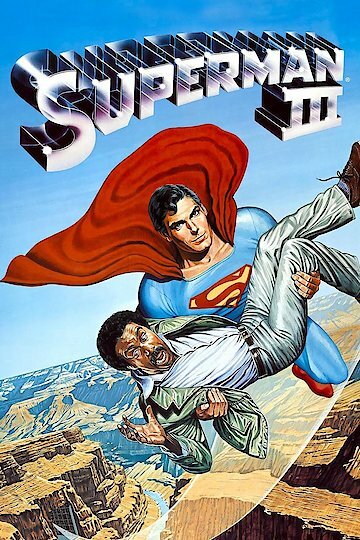 Superman III is a 1983 film with Christopher Reeve reprising his role as the beloved superhero. It's an action film with plenty of adventurous rescues. Early in the movie Superman saves a man drowning in his vehicle and rescues a work crew at the scene of a fire at a chemical plant. Along with action, the film also boasts a large cast including Richard Pryor. Pryor, known for comedic roles, plays one of the villains in this sequel. He is a computer programming genius who teams up with a wealthy businessman, played by Robert Vaughn, who wants to control the world. They start by using computer technology to impact a weather satellite that destroys the entire coffee crop in Columbia. After the attempt at cornering the coffee market, Vaughn and his even greedier sister go after the world’s oil supply. In order to succeed they'll have to prevent Superman from thwarting their evil plans. Pryor’s character is tasked with recreating Kryptonite. He creates a nearly perfect form of Kryptonite, one that transforms Superman into a selfish, lazy superhero but doesn’t quite kill him. Meanwhile, Superman’s alter ego, Clark Kent, is busy attending his high school reunion in Smallville. He rekindles a friendship with Annette O’Toole who plays the popular girl from school, Lana Lang. The friendship could definitely develop into something more, but O’Toole’s character is also enamored with Superman. The rest of Metropolis, though, is getting tired of Superman. The Kryptonite is causing him to drink alcohol and sabotage oil tankers. In one of the film’s most well-known scenes, the Man of Steel and Clark Kent battle it out in a wrecking yard to see who will control the soul and strength of Superman. There are more battles to come, too, as Pryor and his cohorts become more powerful. Superman has to conquer his own demons and the bad guys before it’s too late. Superman III is currently available to watch and stream, buy on demand at Amazon, Vudu, Google Play, FandangoNow, iTunes, YouTube VOD online.